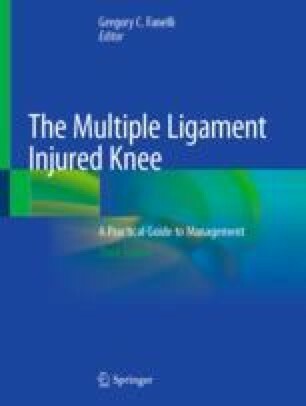 The multiple ligament injured knee is a challenging injury, which can be complicated by concomitant ipsilateral extensor mechanism injuries. The diagnosis of patellar and quadriceps tendon ruptures as well as patellofemoral instability in the multiple ligament injured knee is uncommon though early recognition is vital to restore optimal knee function. The classic mechanism of injury of the knee extensor mechanism is eccentric contraction of the quadriceps muscle against the weight of the body. Patients less than 40 years of age are more likely to rupture the patellar tendon off the inferior pole of the patella while those older than 40 years of age more often rupture the quadriceps tendon. The forces involved with the multiple ligament injured knee can also result in patellar tendon avulsion off the tibial tubercle. Physical exam is often quite limited in the acute setting of these injuries. Exam findings of patella baja or alta along with an associated suprapatellar or infrapatellar defect can aid in the diagnosis of extensor mechanism disruption. Medial or lateral patella subluxation or dislocation can also occur in the presence of a multiple ligament injured knee. X-rays and MRI of the multiple ligament injured knee assist in defining the injury and confirming the involved structures. Management of extensor mechanism disruption or patella instability focuses on acute operative fixation utilizing nonabsorbable sutures to improve clinical outcomes. The injured structures based on physical exam and MRI are repaired to the patella, tibial tubercle, or femur depending on the injury. Repair of chronic injuries to the extensor mechanism often requires reconstruction with the use of allograft tissue. Postoperatively, early rehabilitation focuses on minimizing the soft tissue inflammatory response followed by range of motion and eventually quadriceps strengthening. The most common complications include knee stiffness along with quadriceps weakness.